Lovely! Patrick still looks great. How did he keep all his hair!! It's pretty much styled the same way, too! If you dyed it black, you'd never know the difference. Patrick Macnee’s son, Rupert Macnee, will be attending Eliot Brodsky’s MONSTERPALOOZA this weekend in Burbank, California, March 28 thru 29. He is looking forward to visiting the event, particularly Sara Karloff’s booth. Sara’s Father, Boris Karloff, worked with Patrick ..."
I have seen very few photos with Patrick in an early period of his career, and this is the best of them from my view. I wrote a comment on Facebook for Patrick about this photo. He has done for us, the fans, a great gift. And it was wonderful to hear him on Facebook yesterday. Another lovely photo of Patrick Macnee from "One Step Beyond" epsiode "Night of April 14th"
You're making me curious to see it now! 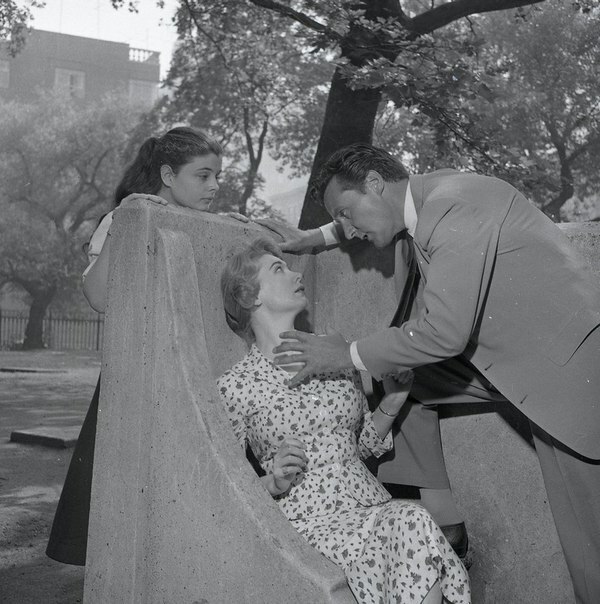 Patrick Macnee in TV film Next Door to Death (1958), story by Charlotte Armstrong originally called "The Hedge Between". Girl is actress Abigail Kellogg as Meredith Henning, neroine of play, woman is actress Gladys Holland as a mysterious widow. Plot: A teenage girl visits her uncle (Patrick Macnee) on the French Riviera and starts looking into a murder that occurred seven years previously, in which the suspects included a butler (Rex O'Malley) and a corrupt cop (David Hurst).